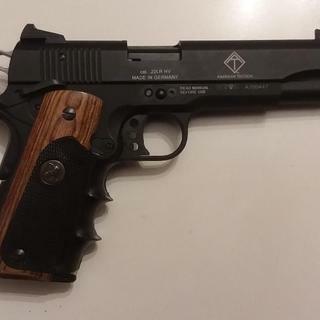 GSG M1911 22LR 10+1 BL/WD 5"
For the money,its a very good buy.I had one its a good shooting gun. looks like a great starter pistol for my son!! Gets great reviews, lots of after market accessories, lots of information on you tube, nice gun, a good trainer that won’t run you dry. FYI the gun shoots great! 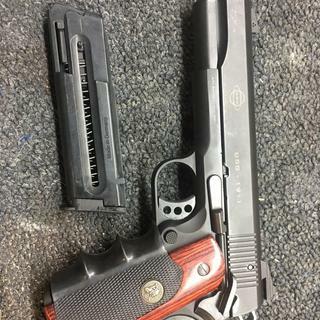 A good target pistol at a great price. Yes, if you use an adapter that fits flush to the barrel and then extends out of the frame while shut. Yes, this has a threaded barrel. FOUND THIS TO BE A WELL MADE PRODUCT. TYPICAL GERMAN MADE QUALITY. WOULD RECOMOND. Well built and enjoyable to shoot. This sweet little shootet is a smooth as butter. No jams, consitant feed and easy target aquisition. Fantastic gun. Fit and Finish is a,amazing. i own two of these and both are very accurate and fun to shoot. Fantastic Gun. Fit, feel, and finish are very nice you wont be disappointed. The accuracy is dead on and very fun to plink with. The GSG 1911 is one of my favorite handguns to shoot. The weight of this steel framed pistol is a joy to hold. It's just point and shoot and watch the bulls eye explode. Check out the video on Military Arms Channel for a super review. This gun is a steal at this price. There are lots of good reviews of this gun on the internet and my experience has been right in line with those expectations. And a big Thanks! to ATI customer service for quickly handling an issue I had due to the fact I was sent a CA (California) gun with a fixed barrel end piece. I didn't order or need a CA version pistol but got one and didn't realize that meant the barrel tip was welded in place. ATI made it right though it wasn't their fault. Watch out that if you live in the "other 49". Gun functions flawlessly, One of the smartest buys I've ever had. Same weight and feel as a springfield 1911, and Colt 1911 in 45. Shoots any ammo very impressed fun to plink with and high customizable. 22 Long rifle high velocity. 10 Round detachable magazine. Semi-automatic recoil operated. 5-inchbarrel. Overall length 8.5-inches. 6 Grooves. 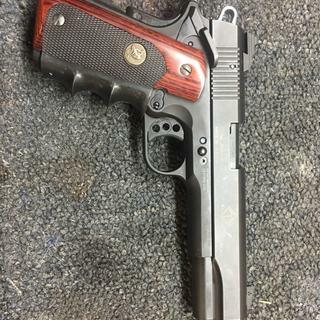 Features the same weight and feel of a 1911 pistol with many interchangable parts.